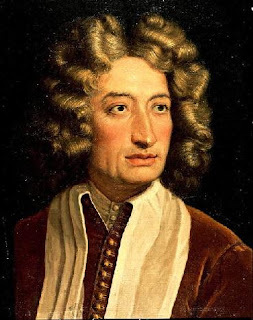 Violinist and composer Arcangelo Corelli was born on this day in 1653 at Fusignano, a small town near Ravenna. He is remembered for his influence on the development of violin style and for his use of the genres of sonata and concerto. Corelli’s 12 Concerti Grossi established the concerto grosso as a popular medium of composition. Named Arcangelo after his father, who died a few weeks before his birth, he studied music with the curate of a neighbouring village before going to the nearby towns of Faenza and Lugo to learn musical theory. Corelli later studied with Giovanni Benvenuti, who was a violinist at San Petronio in Bologna and in 1670 he started at the Philharmonic Academy in Bologna. He moved on to Rome where to begin with he played the violin at a theatre. It is known that by 1677 he had written his first composition, a Sonata for Violin and Lute. By 1675 Corelli was third violinist in the orchestra of the chapel of San Luigi dei Francesi and by the following year he had become second violinist.In 1681 his 12 Trio Sonatas for two violins and a cello were published and the following year he became first violinist in the San Luigi dei Francesi orchestra. In 1687 Corelli became musical director at the Palazzo Pamphili, where he performed, conducted and organised important musical occasions. On one occasion he conducted a large orchestra of stringed instruments to entertain the British ambassador, who had been sent to Rome by King James II of England to attend the coronation of Pope Innocent XII. Corelli was also a brilliant teacher and among his many students was the young Antonio Vivaldi. Considered to be the best violinist of his time, Corelli was invited to Naples in 1702 to perform a composition by Alessandro Scarlatti in the presence of the King. Corelli died in Rome in 1713 and his 12 Concerti Grossi were published the following year in Amsterdam. Both Bach and Handel are said to have studied his work and been influenced by him. Fusignano, where Corelli was born, is a comune in the province of Ravenna in the Emilia-Romagna region. 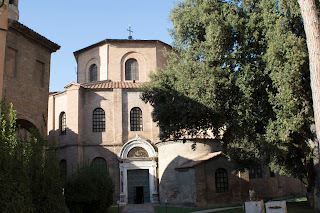 Ravenna was the capital city of the Western Roman Empire from 402 until its collapse in 406. The city’s Basilica of San Vitale is famous for its wealth of Byzantine mosaics, the largest and best preserved outside Turkey, and the church is on the Unesco World Heritage list. Corelli is buried in the Pantheon in Piazza della Rotonda in Rome . Considered to be Rome’s best preserved ancient building, the Pantheon was built in AD 118 on the site of a previous building dating back to 27 BC. It was consecrated as a church in the seventh century and many important people, including Victor Emanuel II, Umberto I and his wife, Queen Margherita, are buried there.